SMART Project Space presents The Dog Builds Its Den, The Mouse Builds Its Burrow, the results of a residency period by Eduardo Padilha (Brazil, currently lives in London) at the European Ceramic Work Centre in Den Bosch (NL). Padilha created a spatial installation with ceramic elements that are references or exact copies of architectural elements, such as life-size doors and windows. In the installation, the originals and the residues of this work process are also being incorporated – referring to both the studio and the workplace, and raising questions about industrial mass production of commodities, craft, and the discarding, recovering and reassembling of the object. With this project, Padilha – who usually works with found domestic objects, industrialized materials, and materials that perish and are discarded – challenged the quality of ceramics as a material with a more permanent state. By producing life-sized doors and windows he really pushed the boundaries of what was possible with this technique, and created ceramic objects that look in fact like a industrial mass product. The objects in this installation are elements that constitute a house and they have been made intentionally as non-functional design artifacts. Most of these objects were molded from industrialized products and made in a craft manner. 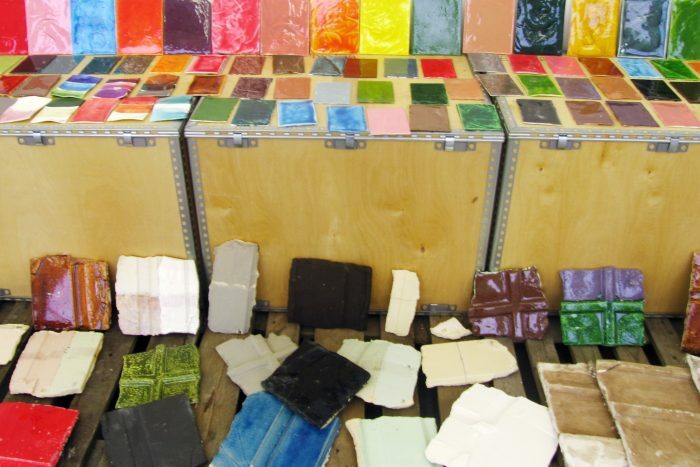 Others elements, like the large tiles bare imprinting shapes from domestic objects that were pressed on the clay. The commonality of elements of this installation is that they are part of the industrial surplus production, which over- populate our world. 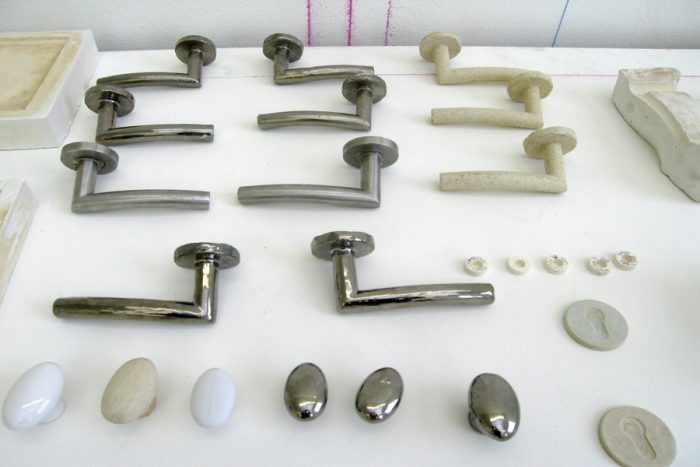 The original pieces came either from the hardware shop that sales by thousands the same design item, or from the flea market that resale these products. Padilha deals with the missing links in this chain that allows a different aesthetical approach and attitude towards the artifact, and the installation is an open-end work, to be consolidated by the viewer. HdB: What made you interested in a residency at the EKWC? 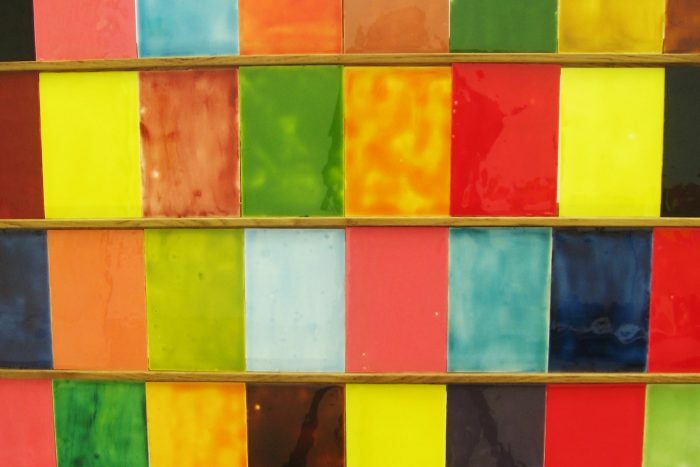 Was there anything that you thought you could do with ceramics that you could otherwise not do? EP: First of all I must say that my educational background is in sculpture. 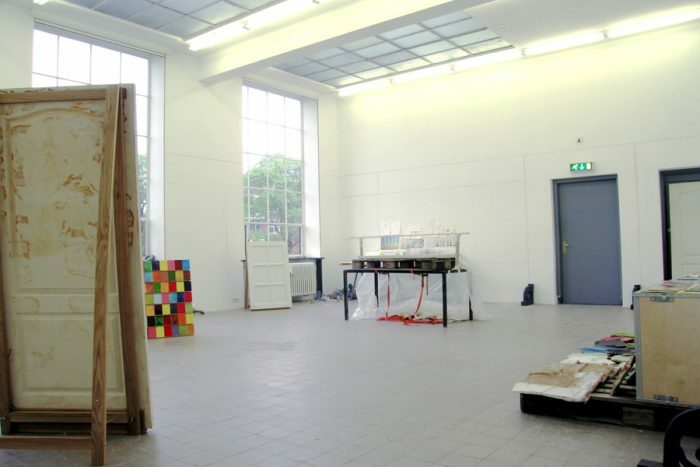 I started studying at Rietveld Academy in Amsterdam in 1990 followed by studies at Carnegie Mellon University in USA and Chelsea College in 1996. I have enrolled in the Sculpture Department in all those places. My practice has developed towards installations and I have never developed any specific skill as sculptor or worked with a specific material. I usually work with materials that perish and are discarded. When I came across the possibility to develop a project at EKWC I thought it would be a great challenge use the quality of ceramics as a material with a more permanent state. I was equally interested in the connotation with craft, a notion that is addressed in previous works of mine. The main difference now is that ceramics has a very different material quality and one needs to be skilled to work with it, in contrast with the materials I normally use, such as discarded fabrics, industrialized materials and found domestic objects. On top of that, ceramics allowed me to develop work that is ‘crafty’ but has an industrial finishing touch. HdB: Did you accomplish the results on the ‘crafts’ level that you were aiming for? EP: The installation developed at EKWC titled The dog builds its den, the mouse builds its burrow has a range of pieces that were made following very simple rules of ceramics and others that demanded a complex process to achieve a result. In the latter case, I am referring to the flat porcelain and large clay pieces that are extremely difficult to make. Another achievement was the so called ‘cold glassing’ that is the epoxy resin instead of traditional glassing. HdB: Could you expand a little bit about the title of the work? EP: For the last twelve years I have been collecting newspapers headlines to use in my work. Since then the sentences were used as embroidery, drawing and as titles. Later on I extended the idea of extracting sentences from books that I read. It is a practice that I have incorporated in my work and responds to a need to re-contextualize either the material or immaterial that circulates around me. In the case of the title The dog builds its den, the mouse builds its burrow it comes from an essay by Yorgos Tzirtzilakes in a book called Less: Strategies of Living by Gabi Scardi. In natural circumstances the dog rather appropriate the space called den than builds it. The same happens with the mouse. This title alludes in a poetical way the idea of taking over a space and creating your own environment. EP: The environment that I would like to obtain will be a combination of studio and workplace. For me the first refers to a place of ideas and experimentation and the second as a place of making. 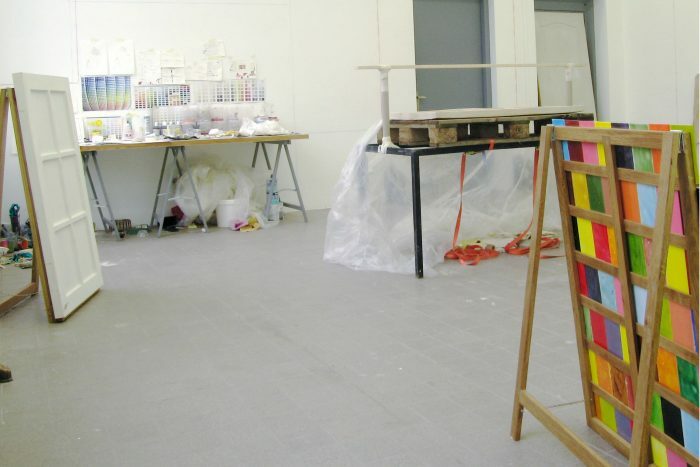 The result of this practice is that I keep the residues of the labour in the same space where the work take shape. I will use the exhibition space as a site for the next stage of development where the walls will be incorporated as part of the installation. The walls will be used as surface for drawing the space that circumspect the installation; simple chalk lines will indicate that the environment is under construction and the project will unfold and go on. HdB: You have been described by other people as “a collector of fragments”. What fragments did you collect this time, and where from? EP: Initially I named the installation as ‘a domestic archeological site’ due its fragmentation and the disposition that the elements where displayed in the studio. This was also because of the apparent lack of unity between all pieces, and the accumulation of samples produced. However, upon closer inspection you will see that all the objects in this installation are elements that constitute a house. They have all intentionally turned into non-functional design artifacts. There is a door, window, stein glass where some were molded from industrialized products and made in a craft manner. 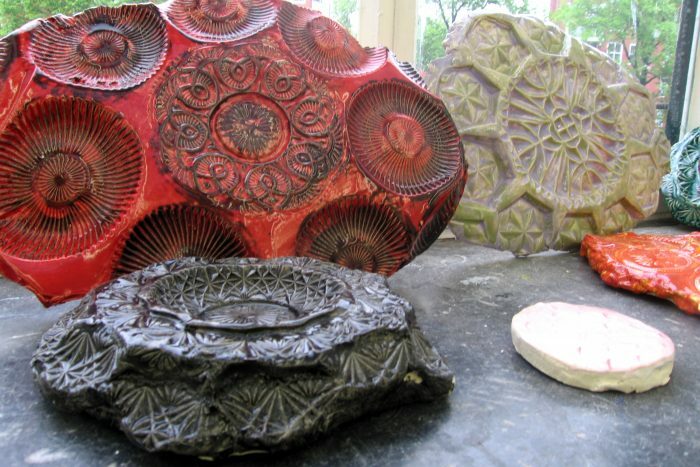 Others elements like the large tiles bare imprinting shapes from domestic objects that were pressed on the clay. The commonality of this installation’s pieces is that they are part of the industrial surplus production, which over populated our world. The original pieces came either from the hardware shop that sales by thousands the same design item or the flea market that resale the products. I am interested in the cycle that encompasses industrial production, the discarding, recover and reassembling of the object. It is a big topic, but I deal with the missing links in this chain that allows a different aesthetical approach and attitude towards the artifact. The installation The dog builds its den, the mouse builds its burrow is an open-end work and is consolidated by the viewer. Do you identify with Bouriaud’s observations, and do you see a parallel with the position of the viewer as described by Gonzales-Foerster when you speak about consolidation by the viewer? EP: The book Postproduction is a very good reference to this installation. During the first couple of weeks that I researched for used materials in the city of Den Bosch I realized that I was not just developing the first ideas for the project but that I was also responding to the system of circulation that is pertinent to the city. The system of ‘recycling’ surplus objects for example is invisible or less obvious to the eyes of an individual due to the system of collection, city planning, classification and sometimes exporting the excess. What I have perceived there was a disruption between consumption and recycling that happens literally underground. That is what I call the missing links that occur in the chain of information. There I find the gap to form my own thoughts and aesthetics speculation about how objects can possibly be made or copied, selected, ‘reintroduced’ and organized. I was aware that while I was constructing my own references the viewer that later on will enter in the installation would be engaged in similar thoughts. Therefore he or she will rearrange in his or her own mind the elements that are deliberately made in fragments in the installation. Also, they will establish the ‘exchange value’ of the objects according to personal references. My attempt is to negotiate a flexible structure derived from a situation where object and subject have a common ground or environment. Hilde de Bruijn is a curator and writer based in Amsterdam. Variable sizes of ceramics tiles like ‘stuccos’ with trace of domestic objects pressed on it.